0 - Dollars -- It's Free! If you've never witnessed a mass ascension, you're in for a treat. Three mass ascensions are scheduled (weather permitting) at 7:00 AM each day. With the help of their crews, balloon pilots lift off from one of two staging areas, filling the early morning sky with a kaleidoscope of color. Have your camera ready for this can't miss photo op. 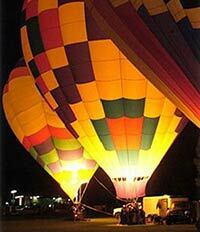 Keep that camera handy for the balloon glows that take place on Friday and Sunday nights at 7:15 PM. 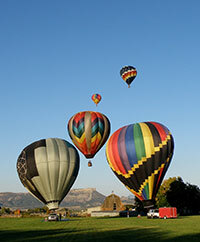 As the burner on the balloons is fired they "glow" like giant lanterns. The effect is both spectacular and magical. Always a favorite, this event never fails to charm and enchant kids of all ages.